Powers/Abilities: Grace Lavreaux possesses the mutant ability to open a portal to a relatively unknown (pocket) astral plane she has complete control over. Calling her realm "Neverneverland", Grace can shape the fabric of reality in this dimension, allowing her wildest dreams and fantasies to become tangible reality. The only recorded limit to her powers in this other realm is resurrecting people who are not native to Neverneverland. With little to no training in the use of her powers and emotionally fragile, Lavreaux was denied mental access to her mutant abilities for decades by Charles Xavier, who feared the damage Grace might accidentally cause if left unchecked. (X-Men I#35 (fb) ) - When she was 13 years old, the woman who would become known as Sunset Grace one night opened a hole in the air. Curious and completely unaware she was actually a mutant, Grace investigated where that hole led to. Discovering an alternate, astral realm where her every wish came true, Grace kept her trips to this fantasyland to herself, enjoying many exciting adventures in Neverneverland until she grew up, got married to Francois Lavreaux and eventually bore a son: Christian. As the demands of married life and motherhood pressed on her, Grace's visits to Neverneverland grew ever more infrequent until she one day stopped going altogether and largely forgot about her powers. Driving home with her family during a rainstorm, the Lavreaux's car skidded off the road and careened down a cliff. While Grace was thrown clear, she watched in horror as her husband and son fell to their deaths. Instinctively reaching out with her mutant abilities in the hopes of saving them, Grace opened a portal to Neverneverland. After the vehicle went through, something inside Grace's mind slammed shut, making it impossible for her to unlock the door again. (X-Men I#35 (fb) - BTS) - Not having lost any of its gained momentum, the car crashed into Neverneverland which ended up killing Francois and Christian instantly. (X-Men I#35 (fb) - Despondent after months of fruitless attempts at accessing Neverneverland, Grace became severely depressed. Losing the ability to talk, walk or even think, her doctors finally called in Charles Xavier who used his mental abilities to reach inside Grace's mind and make a connection. Even though Xavier helped Lavreaux pick up the pieces of her life, he was seemingly unable to restore the connection to her powers. (X-Men I#35 (fb) - BTS) - Charles Xavier had secretly placed mental blocks around the part of Grace's mind that controlled the access to her powers. Fearing what might happen to reality if she ever lost control of her gifts, Charles decided it was for the best if she no longer used them. (X-Men I#35 (fb) ) - Grace remained on St. Barth's and found work as a craftswoman, selling her goods to tourists on the beach. As the years went by, she became better known by her nickname Sunset Grace. 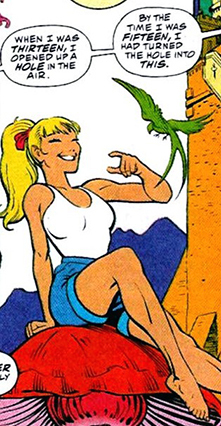 While trying to hawk her wear, she met Scott and Jean Summers who were on the island enjoying their honeymoon. Grace was still in their immediate vicinity when the newlyweds were forcibly yanked into the future. 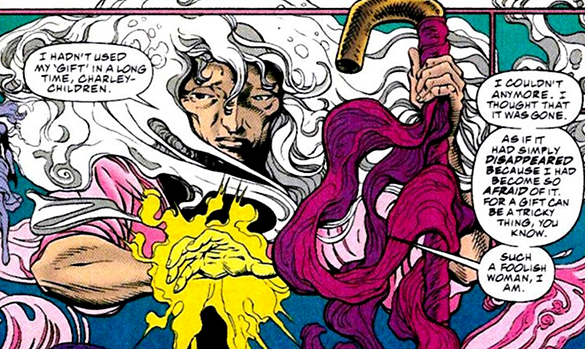 This violent act severed the psi-link between Scott and Jean, causing a psionic backlash that affected Grace and shattered Xavier's psychic blockade. With memories and emotions rushing back to her, Grace rediscovered her mutant powers and opened a portal to Neverneverland. (X-Men I#35 (fb) - BTS) - The first things Grace encountered upon returning to her paradise, were the corpses of her family. Overcome with grief, she retreated into herself and lost control over the portal which started increasing in size back on Earth, catching the attention of Nick Fury and SHIELD who sent in an investigative team. 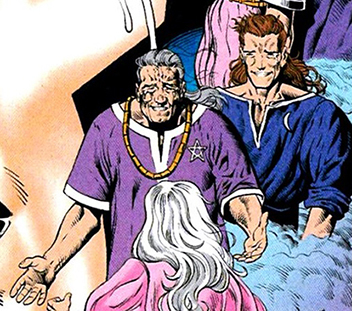 Determining Grace's portal was actually an exponentially expanding interdimensional rift that threatened to swallow the entire planet within hours the SHIELD telepaths managed to establish mental contact with Grace in Neverneverland who explained about Charles Xavier and asking for Scott and Jean's help. (X-Men I#35) - Nick Fury located Scott and Jean and brought the couple up to speed even though they were slightly disoriented (they had just returned from 12 years in the future raising Cable). Accompanying them to the rift, Fury watched how Jean was sucked in when she established mental contact with Grace. Scott followed her and together they made their first steps into Neverneverland where they soon met Grace who had managed to repress the fact her husband and son had died. After talking with the woman, they discovered her origins, the involvement of Xavier and how they themselves had inadvertently caused the current crisis. Jean then used her telepathy to focus Grace's abilities on restoring her husband and son back to a life. Deciding to settle for an illusory but happy and safe existence in Neverneverland, Grace opted to stay behind. After Scott and Jean returned home, Lavreaux closed the rift from her side and lived happily ever after. Comments: Created by Fabian Nicieza (writer), Liam Sharp (pencils), Robin Riggs (inks). The tragic tale of Grace Lavreaux is such a minor footnote in overall X-Men history that the Dutch Marvel Comics publisher Juniorpress decided to skip it altogether. Imagine my surprise when I uncovered this done in one story, published a mere month before the big brouhaha known as the Phalanx Covenant crossover. Grace's powers are more than a little reminiscent of Jimmy Jupiter, though it's unknown if she was able to bring her Neverneverland creations back to Earth-616 like Jupiter did with his armies. The fact a far from graduated Charles Xavier was brought in to help Grace deal with her depression (rather unethically by shutting her powers off), make his claims he wasn't aware of other mutants until after he encountered Amahl Farouk in Egypt dubious at best. Then again, Charles' appearance in Neil Adams' First X-Men limited series pretty much drove an army truck through that particular continuity note. Completely unaware of her mutant abilities, Francois Lavreaux romanced and eventually wed (Sunset) Grace. Together with their only child Christian, the Lavreaux family lived a relatively normal life on St. Barth's. One day, after returning home by car from the market in Gustavia, they were caught in a freak rainstorm. Christian was nervous, humming in the backseat to calm his nerves, while his father desperately tried to keep the car on the road. Failing to do so, the Lavreaux's automobile skidded off the road and started to head off a nearby cliff. Grace was thrown clear, but Francois and his son were starting to drop down. However, Grace used her long dormant mutant powers to open a portal to her fantasy realm Neverneverland in hopes of saving her family's life. Unfortunately, while Francois and Christian did appear in Grace's personal dimension, their car had built up considerable momentum during its fall, killing father and son on impact. Their bodies were left undisturbed in the car wreck for decades when Grace proved unable to return to Neverneverland. When she finally did and found the remains of her family, she became inconsolably saddened. In the end, Jean Grey managed to use her telepathic powers to indirectly cause Grace to create Neverneverland copies of Francois and Christian who would live with her until the end of her days.